The North Texas Chapter of Safari Club International is pleased to have you join us, we are about hunting, conservation, hunters and hunting rights. As a non-profit 501C3 and 501C4 organization, we are focusing funding on wildlife education, conservation, and humanitarian programs, as an example our “Sensory Safari” is utilized to educate hundreds of blind, sight impaired, autistic and physically challenged children, men and women through out the North Texas area. Please browse our activities and events, we would love for you to join us at an upcoming function, or contact us for more information. Here are some of the projects that we sponsor. 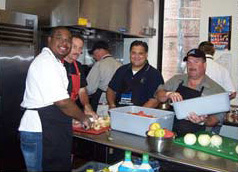 The North Texas Chapter of SCI is actively helping local community efforts in their fight against hunger. This year we helped the Tarrant Area Food Bank collect more than 6,500 pounds of protein meat, mainly from hunters’ freezers, that will go directly to helping those less fortunate. In October 2006, the North Texas Chapter of SCI was on hand at Cabela’s to collect meat from hunters who wanted to clear out their freezers. A most rewarding and moving program whereby individuals with visual impairment are offered a unique opportunity to “see” wildlife through the sense of touch. By utilizing thousands of donated and borrowed animal mounts, skins, skulls, and horns, tens of thousands of individuals who are visually impaired and disabled have been able to gain a “visual” perspective of what nature’s animals are like. Each year, SCI member volunteers assist between 60,000 to 70,000 participants through a network of full mounted, table displays, and Sensory Safari trailers describing the animal’s size, sounds, habitats and behaviors. Whether touching the inside of an alligator’s long snout, feeling the serpentine neck of a giraffe, stroking the thick fur of a bear, or hearing the game calls of waterfowl and big game, the participants get to experience what even many sighted people have not. Homer Tompkins of the North Texas Chapter of SCI was instrumental in developing and organizing Sensory Safaris that other SCI chapters now implement. The American Wilderness Leadership School (AWLS), is the SCI Foundation’s educational facility located in Jackson, Wyoming. The school offers summer programs to teach educators how to include the outdoors and conservation topics into their school’s curriculum. There are 8-day teacher workshops that include firearm safety, archery, fly tying, wilderness survival, outdoor interpretive techniques, and wildlife conservation. The North Texas Chapter of SCI was proud to award Keith Martz, a teacher from Briarhill Middle School in the Lewisville Independent School District with a full scholarship to AWLS. Safari in a Box is a K-12 education kit designed to provide exciting, hands-on learning. It gives teachers and others who work with young people resources and ideas to introduce youth to important concepts of habitat, wildlife management and impacts resulting from human and wildlife interactions. 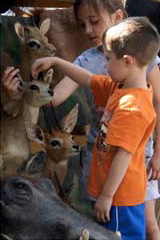 Safari in a Box offers children and adults a hands-on wildlife experience in an urban, suburban, or rural setting, in or out of doors. For many, the kit is the gateway to appreciation of the outdoor world and provides their only contact with a wild animal. Safari in a Box helps adults and young people in our increasingly urban environment re-establish their connection with our land and their link to the natural world.